Be an active member! Tell us what sort of programming, topics, or site visits would you like to participate in September 2018 through June 2019. What tech topics are on your mind? What makes a techie’s heart skip a beat? Is there an organization, program, team, or business location you’d like to hear from or visit? We’ve developed a survey (see below) to help us find out which topics our local techies are interested in. Select which topics you’d like to hear about. If you’re interested in a topic not mentioned in our survey, we have an option for you to suggest additional topics. If you have a person or location in mind that you would like to hear, see, or visit you can mention that as well! Please not that we are a not-for-profit, so we look for speakers from the Valley with minimal or no travel or other expenses. Summary of ALL the luncheons we’ve ever held (2005-2018) (pdf). 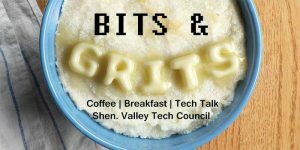 Love SVTC events and programming? How about joining the Events and Programming Committee? Send Nicky an email, info@svtc-va.org, to join. To give us your input, please complete the form below.